Received an offer today from an American Company ” Patent and Trademark Organisation LLC ” offering to update a trade mark which is due to expire next year . They charge a mere $1290 for the privilege of re registering the trade mark which if you renew directly through the Intellectual property office would cost you $402.50. 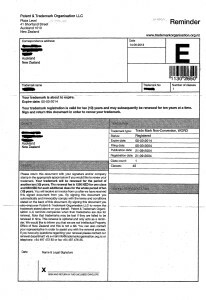 The letter that I received had terms and condition written on the back, I initially thought the back was grey but on closer examination words can just be made out, no doubt despite their visibility they would be binding and I would probably find that they are enforcible only through American courts. 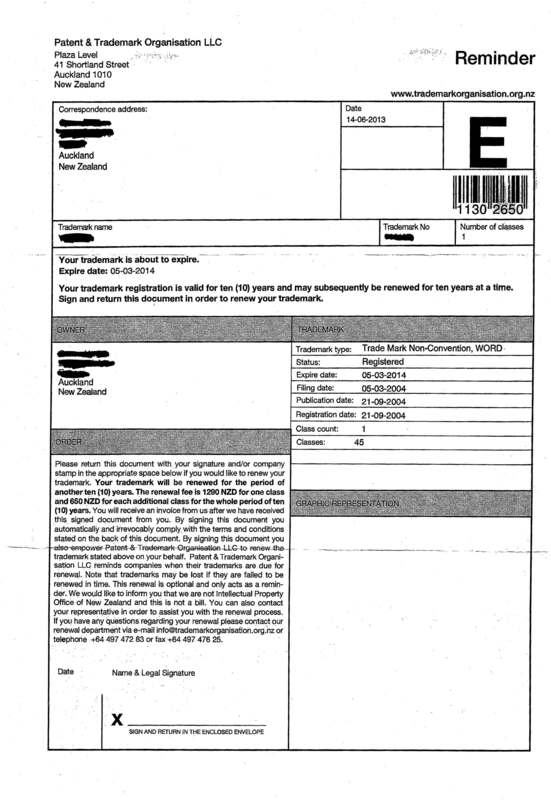 There was no address on the actual letter but the PO Box number which was given was Patent and Trademark Organisation, PO Box 2331 Shortland Street Auckland 1140. I note that the Australian IP office also has it listed on its warning page . Before paying a fee for any IP-related service, we recommend that you carefully consider what, if any, protection, promotion or other value the service will provide. If you wish to use a lawyer for filing and maintaining your intellectual property then we can recommend a New Zealand Law firm which can act for you .